There are the typical TV dads, and then there are the iconic ones. You have the Cliff Huxtable's, the Carl Winslow's, and James Evans, but to me you stood out because I grew up watching you on TV. You bought a new light to parenting that wasn't seen before. You were kind, funny, interactive, steadfast, and even stern when need be. But the most endearing trait about you was the fact that you gave everyone love unconditionally and equally, even the new Aunt Viv. There were moments of extreme moment where they really needed to lean on you, like when Will's father left him again, or that time when Carlton was shot and when Trevor died for Hilary. You did a pretty great job of raising Ashley and Nicky; they came into their own very well. You also never lost sight of who were, and where you came from. You often reminded people that you were from Yamacraw, North Carolina and all of the things that you've done to support African Americans in the 60's during the civil rights movement on the way to becoming The Honorable Phillip Banks. All in all, you are missed as one of the greater TV dads because some of us actually learned valuable and important lessons in how a man is supposed to treat his family, all the while being his own individual. Now that you're no longer here with us on this Earth, it's up to men like me and the ones after to follow in your footsteps of support and love towards everyone that we love and need our help. You can rest easy knowing that there's at least one man willing to take up the mantle of loving his family like you did. I'm going to go because I'm getting a little teary eyed thinking of all the times you've held the family down and how much they love you. I'm going to quote some lyrics from this rapper named J. Cole who also has the same sentiments that I have towards you, rest easy. First things first, R.I.P. 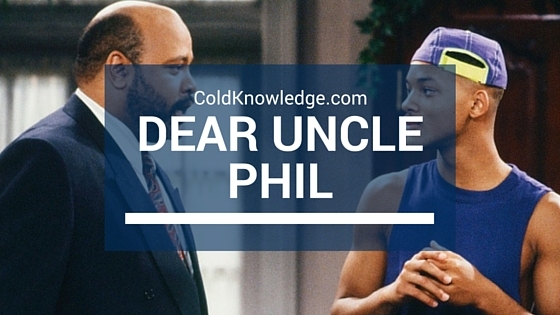 Uncle Phil. For real, you the only father that I ever knew. I get my chick pregnant, I'ma be a better you.